For years Mansory has been committed to perfection, craftsmanship and well-engineered technology. Mansory is headquartered in Switzerland, allowing them to stay up to date and constantly improve upon the newest Porsche offerings. Mansory stands for driving pleasure, stylish design, and progressive engineering. Mansory's customization and cosmetic upgrades also fall in line with this performance-driven philosophy. Their vast product line offers complete aerodynamic kits, ultra-light alloy rims, and powerful engine performance parts; all of which match the high quality workmanship of the exotic vehicles they are designed for. Production meeting the highest technological standards, masterful workmanship, and the finest materials - that is Mansory's quality standard. The most effective and efficient way to improve a cars performance is reducing its weight. Weight reduction increases acceleration, throttle response, handling, braking, and fuel economy. Carbon fiber is key to improving performance, that's why it is found so frequently in today's modern race cars. Carbon fiber is much lighter than the heavy factory components it replaces. The benefits of Carbon fiber are twofold. Not only is it lightweight, but it is also very strong and gives your car a unique look. Its unique weave pattern is known by car enthusiasts worldwide. But, if you prefer, it is possible to paint over carbon fiber if you want to keep the stock look of your vehicle. 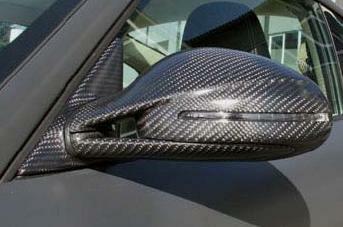 Mansory Carbon Fiber Side mirrors are a great way to add a unique flair to your Porsche. Made from lightweight Carbon Fiber, these mirrors give your car a more aggressive look. The weaved pattern on the Carbon Fiber looks great unpainted and stands out against a painted surface, or can be painted. Constructed of lightweight Carbon Fiber. Retains Side mirror turn signals.